The W250 constantly monitors the electric field generated by the individual wound. The wound-generated electric field is the key, bioelectric controller of wound healing—the 'current of injury'. The W250 self-adapts to the individual wound, and gives real-time, smart electrical stimulation that precisely supplements or replaces the wound-generated electric field. The W250 treats and prevents infection with silver cation (Ag+) delivery direct to the wound bed; also effective for antibiotic resistant superbugs. The W250 stimulates fibroblast cells in the wound to self-modify to have tissue regeneration abilities resembling stem cell potentials. The SIS machine W250 electro-stimulation (electrotherapy) technology integrates key wound healing and tissue regeneration medical science that has remained in the research field until now. The skin acts as an electrical battery. As a result of the normal, bidirectional 'pumping' of chemical ions through the skin layers, a constant electrical potential (voltage) of 10/20-50/70millivolts is permanently maintained across the skin, termed the transepidermal or transepithelial potential difference (TEP). Intact skin has relatively high electrical resistance to the TEP. When skin layers are damaged or destroyed in any kind of wound, their electrical resistance to the TEP ‘skin battery’ immediately drops or disappears. The resulting TEP-generated electric field is electrically negative at the wound edges relative to the deeper tissues. Many key cells involved in the healing response are sensitive to the TEP-generated electric field. The TEP electric field is the informational signal to these cells to move towards the wound surface, as well as for their differentiation, division and proliferation. These electric field-sensitive cell types include fibroblasts, chondrocytes, keratinocytes, endothelial cells, epithelial cells, mature macrophages, granulocytes and leukocytes. The TEP voltage through the wound is the key, local bioelectric controller of wound healing. Treatment of present infection and prevention of infection. 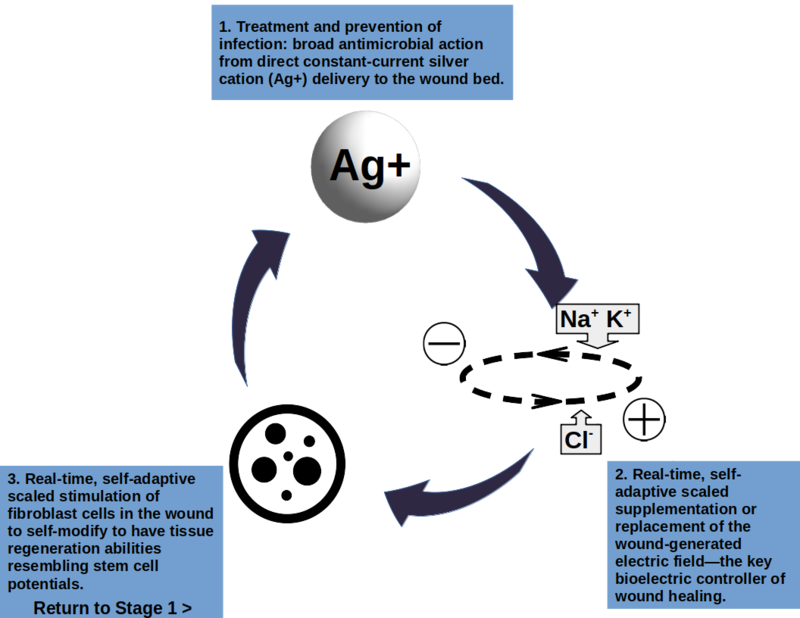 Broad antimicrobial action from direct constant-current silver cation (Ag+) delivery to the wound bed. The non-wound-contacting SIS electrode positioning for surface wounds, eliminates all physical disturbance of the wound, and any interference with granulation tissue formation—as with most wound dressings. Bioelectrically matching, self-adaptive supplementation or replacement of the wound-generated electric field. Most wound healing electrotherapy devices use non-adaptive, 'blanket' frequency-based electrical stimulation, non-specific to the individual wound. The SIS machine W250 model's approach of real-time, self-adaptive wound-generated electric field supplementation or replacement, has major advantages. Electrical stimulation of tissue healing and regeneration. Stimulates fibroblast cells in the wound to self-modify to have tissue regeneration abilities resembling stem cell potentials. These newly modified cells become available to remodel and form new tissues during the proliferative and remodeling phases of wound healing to an extent not normally possible in the human body. Bioelectric and electro-stimulation parameter data readout. Continuous electrical resistance monitoring at the edge of a superficial wound or automatically calibrated through a deeper surface wound, provides an accurate assessment of the rate and stage of individual wound healing. 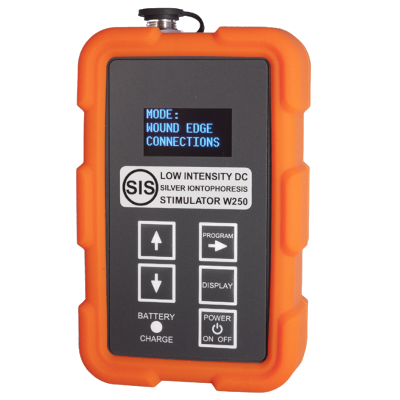 Under certan conditions, the SIS W250 wound electrical resistance monitoring has the advantage that it can be performed without having to remove dressings and without visual examination.